Halloween can be a traumatic and even dangerous time for pets. As the only “Garfield-approved” pet-sitting association, Pet Sitters International cautioned the fat cat about eating candy. The association shares these suggestions with its members, and the 740,000 pet owners who use its members’ services, in hopes that all pets have a howlin’ good Halloween. 1. Think things through before putting your pet in a Halloween costume. Unless your dog or cat is extremely receptive to this kind of thing, you could be causing discomfort and stress. If you do dress up your pet, make sure the costume doesn’t obstruct your pet’s vision and isn't uncomfortable or unsafe. 2. Know when to say “No!” This isn’t news to anyone, but dogs and cats will beg for treats. But please remember that Halloween goodies are for the Trick-or-Treaters, not pets. Most pet owners know that chocolate is poisonous to pets, but candies made with the sugar substitute xylitol are also dangerous. Candy wrappers can also pose a problem. Be sure to keep candy and candy wrappers out of paw’s reach. 3. Your pets might not be the party animals in your family. If you’re having a party, put your pets in a room where they won't be disturbed. Be sure to check on them and reassure them that everything is all right. They may not be prepared to take part in the Halloween fun, but they don’t want to be isolated and ignored, either. Also don’t give alcoholic beverages to dogs, cats, birds or any other animals. Keep a watchful eye on party guests. Some may think it's funny to give an animal alcohol, but it can result in serious illness and even death. 4. Don’t let your pets become escape artists. Be extra careful that cats or dogs don't dart outside through an open door. Once a pet is out the door, its familiar neighborhood can become unfamiliar and scary territory on Halloween. House and yard decorations, Trick-or-Treaters and increased traffic can panic an escaped pet. A panicked pet may run too far from home to find its way back. 5. (Fire) safety first. Pets don’t understand that small fires are inside of Jack-O-Lanterns. Dogs, particularly enthusiastic tail-waggers, can easily knock over a pumpkin and cause a fire. Curious kittens also run the risk of getting burned. Place Jack-O-Lanterns where they can’t be knocked over by swinging tails or prying paws. 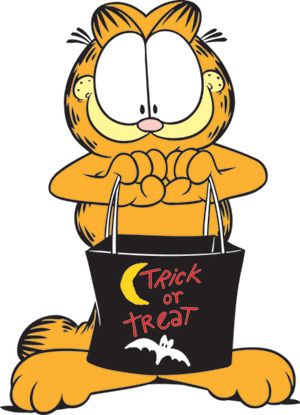 Take it from former scaredy cat Garfield, Halloween can be a spooktacularly good time for people and their pets. For more information about PSI or to locate a professional pet sitter in your area, please visit http://www.petsit.com/locate. Established in 1994, Pet Sitters International (PSI) is the world’s largest educational association for professional pet sitters, representing nearly 7,000 independent professional pet-sitting businesses in the United States, Canada and abroad. PSI provides members with access to affordable bonding and liability insurance as well as educational resources that include a comprehensive Certification Program, Pet Sitter’s WORLD magazine, The Scoop e-news and PSI’s annual Quest convention. For more information, visit http://www.petsit.com, home of the Official Pet Sitter Locator™ or sign up to receive The Scoop on Pet Care. Visit the PSIStoreOnline, the largest specialty retailer of products for pet sitters and pet-sitting business owners.